Air toxics, also known as hazardous air pollutants (HAPs), are 187 pollutants that EPA has identified as being known or suspected to cause cancers and other adverse health effects, including damage to the immune system, neurological problems, respiratory effects, and birth defects. Most air toxics are emitted into outdoor air from anthropogenic sources, such as mobile sources and industrial sources. However, forest fires and other natural sources also emit air toxics. People exposed to air toxics at sufficient concentrations and durations may have an increased chance of getting cancer or experiencing other serious health effects. Sufficient ambient air monitoring data are currently available to assess nationwide outdoor air quality trends for eight of these 10 pollutants. Monitoring data have not been collected at enough sites and for long enough to reliably assess outdoor air quality trends for either naphthalene or for other PAHs. Taken together, the eight remaining air toxics account for 84 percent of the estimated nationwide incremental cancer risks associated with breathing outdoor air pollution (U.S. EPA, 2011) and these include some of the most commonly measured air toxics. Information on emissions sources and health effects associated with the eight air toxics considered in this indicator are available from many sources (e.g., U.S. EPA, 2012), including Toxicological Profiles published by the Agency for Toxic Substances and Disease Registry and Toxicological Reviews available from EPA’s Integrated Risk Information System. This indicator presents ambient concentration trends for eight air toxics in micrograms per cubic meter (µg/m3). Trends for the eight air toxics are based on annual average concentrations, which were calculated mostly from 24-hour measurements collected at monitoring stations nationwide; for benzene and 1,3-butadiene, some 1-hour measurements were also considered. For the organic compounds considered in this indicator, trends are for 2003 to 2013. For arsenic and hexavalent chromium, monitoring data are available to establish trends only from 2005 to 2013 and 2012, respectively. The numbers of monitoring sites with sufficient data to calculate concentration trends varied by pollutant: from 14 sites for hexavalent chromium to 137 sites for benzene. These include monitoring sites in the National Air Toxics Trends Sites (NATTS) network and all other air quality monitoring sites in the United States where the pollutants were measured using comparable methods. The trend sites for a given pollutant were based on those that had sufficient data for calculating annual average concentrations for at least 75 percent of the years covered in the indicator. A complete account of data processing steps—including the site selection criteria and the approach used to consider non-detect observations—are explained in this indicator’s technical documentation. For the organic compounds considered in this indicator, monitors measure ambient air concentrations of gases. For arsenic and chromium, monitors measure the amounts of these metals within particulate matter, and the available air quality measurements for these two pollutants are based on multiple particle size fractions. The indicator presents data for the particle size fractions currently considered in the NATTS network: arsenic trends are based on measurements of particulate matter with aerodynamic diameters of 10 microns or smaller (PM10), and hexavalent chromium trends are based on measurements of total suspended particulate (TSP). Exhibit 1 summarizes outdoor air quality trends for the eight air toxics considered in this indicator, and Exhibits 2 to 9 present the trends for the individual air toxics. For seven out of the eight air toxics, annual average concentrations decreased over the period of record considered in the indicator (2005-2012 for hexavalent chromium, 2005-2013 for arsenic, and 2003-2013 for the remaining air toxics). The reductions ranged from 17 percent (formaldehyde) to 73 percent (tetrachloroethylene). 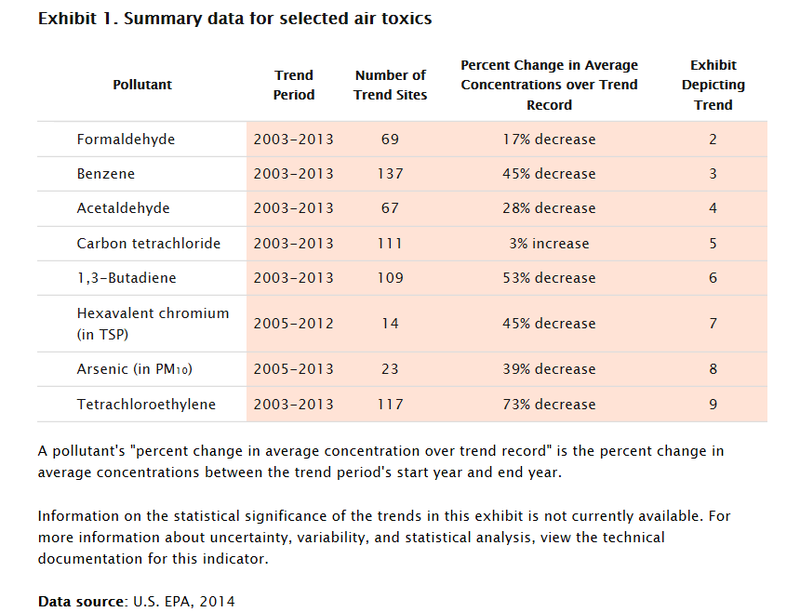 These downward trends in air toxics concentrations are generally consistent with downward trends in air toxic emissions that have been observed since 1990 (Air Toxics Emissions indicator). As the exception, the average carbon tetrachloride concentrations indicated by the trend sites increased by 3 percent from 2003 to 2013. Most industrial and consumer uses of carbon tetrachloride were phased out as a result of international treaties, but the pollutant remains in the atmosphere due primarily to its extremely long half-life in the troposphere (Mohamed et al., 2002). Also shown in Exhibits 2 to 9 are the 90th and 10th percentiles based on the distribution of annual measurements at the monitoring sites. This provides additional graphical representation of the distribution of measured concentrations across the monitoring sites for a given year. Thus, the graphic displays the concentration range where 80 percent of measured values occurred for that year. The data summarized in this indicator are based on the subset of monitoring sites with sufficient data over the period of record for the individual pollutants. These monitoring sites are primarily (but not exclusively) located in urban areas. The indicator presents trends for the eight air toxics that account for a majority of the estimated nationwide incremental cancer risk attributed to breathing outdoor air pollution emitted from sources of outdoor origin and with data available to characterize trends. Many additional air toxics are commonly found in outdoor ambient air. To ensure that long-term trends are based on a consistent set of monitoring sites, selection criteria were applied to identify the subset of air toxics monitoring sites with sufficient data to assess trends over the period of record. Monitoring sites without sufficient data are not included in the trend analysis. Nationwide trends in the distributions of average concentrations do not necessarily reflect trends at individual monitoring sites or at locations where monitoring has not occurred. Measured concentrations below the detection limits were used as reported; and non-detect observations were replaced with concentrations of zero in the trend analysis, introducing some uncertainty into the calculated trends, particularly for the 10th percentiles shown in the exhibits. Uncertainty in trends is greatest for the pollutants with the highest proportion of data below detection. This indicator was based on ambient air monitoring data from EPA’s Ambient Monitoring Archive for HAPs (U.S. EPA, 2014). The technical documentation for this indicator describes the site selection criteria and data processing methodology that were applied to generate the trend charts for the individual air toxics. The trends are based on the subset of monitoring stations that have sufficient data to assess trends since 2003 or 2005, depending on the pollutant. See Data Availability in this indicator’s Technical Documentation for links to the spreadsheets with all underlying data used to develop this indicator. McCarthy, M.C., T.E. O’Brien, J.G. Charrier, and H.R. Hafner. 2009. Characterization of the chronic risk and hazard of hazardous air pollutants in the United States using ambient monitoring data. Env Health Pers 117(5):790-796. Mohamed, M.F., D. Kang, and V.P. Aneja. 2002. Volatile organic compounds in some urban locations in United States. Chemosphere 47:863-882. U.S. EPA (United States Environmental Protection Agency). 2014. Data from the Ambient Monitoring Archive for HAPs. Accessed 2014. http://www3.epa.gov/ttn/amtic/toxdat.html#data. U.S. EPA. 2012. Health effects notebook for hazardous air pollutants. https://www.epa.gov/haps/health-effects-notebook-hazardous-air-pollutants. U.S. EPA. 2011. 2005 national-scale air toxics assessment. Last accessed April 25, 2012. http://www3.epa.gov/ttn/atw/nata2005/.